Pi Kitchen + Bar is an attractive spot tucked away in the Embassy Suites Hotel in Midtown. Hotel restaurants often get a bad rap, sometimes without cause, and I heard that Pi had a make-over and a new menu. Given that information, I thought the spot deserved a chance to show whether it can compete with the other players in Midtown Anchorage. A friend joined me for the recent Pi Kitchen experience. We began with beef barley soup and Caesar salad. The soup was flavorful, with tender bits of beef in a rich broth accompanied by a variety of soft vegetables and barley. 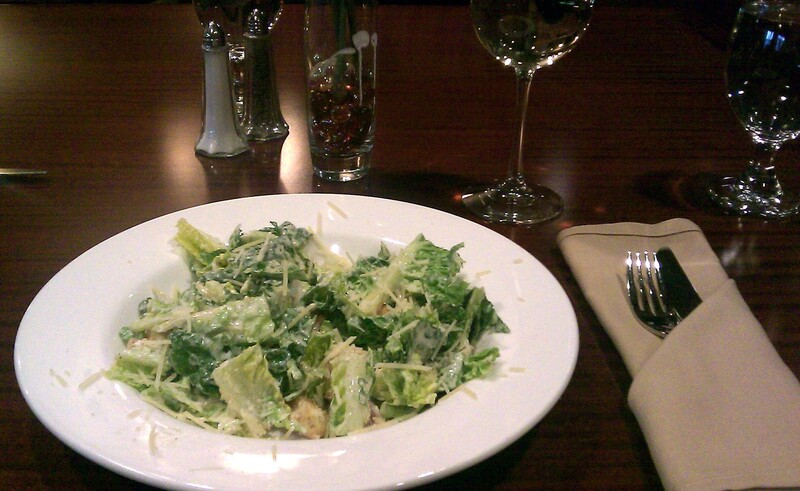 By contrast, the salad was quite unremarkable. I was expecting something superior to convention food, but unfortunately, the dish was indistinguishable from any of the Caesar salads I’ve consumed during catered events in hotel banquet halls. 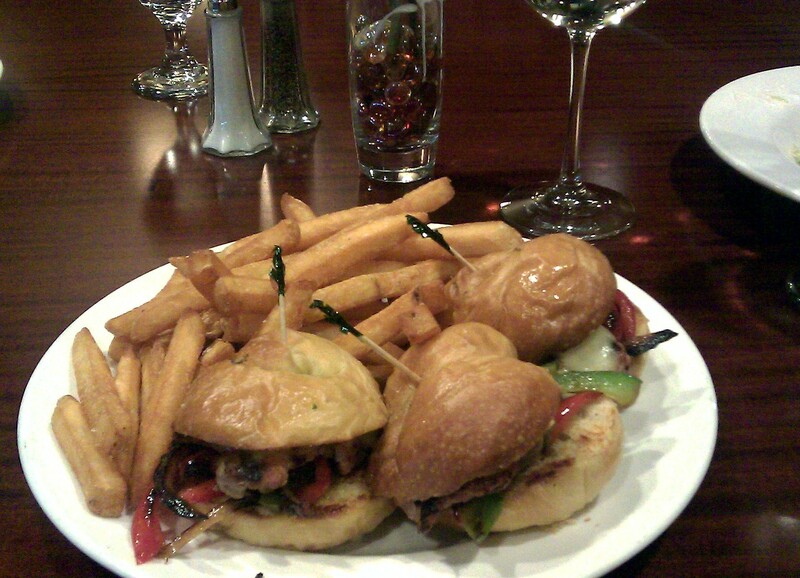 For my main I decided to sample a trio of pork tenderloin sliders accompanied by fries. While the fries were crispy (at my request), they were standard pudgy frozen potatoes and unremarkable. I took a bite of my sandwich and found a soft, slightly sweet roll — and nothing else. A second bite revealed a bit of grilled pepper and onion along with an oily, soggy lower bun. On the third bite I finally got a bit of tender, but somewhat under-seasoned, pork. When I opened the trio to add a bit of salt I found there was scant meat on any of the sandwiches. One slider had just half of a small medallion of tenderloin, perhaps the size of a quarter. It seems the pork tenderloin sandwich offering would be better billed as a vegetarian dish. My companion ordered the grilled halibut entree. Her tiny bit of fish was a slender, pale tail end that was so thin it appeared to resemble cod rather than halibut. 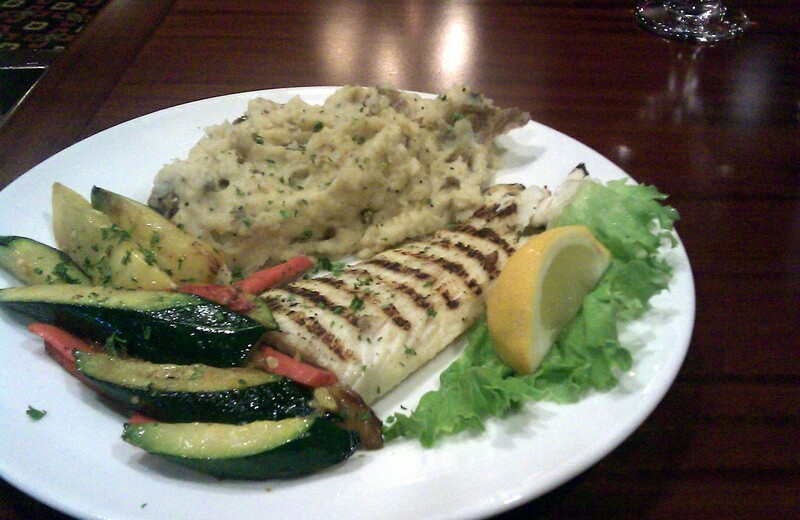 To top things off, the fish was over-cooked, dry and cold, as were the accompanying mashed potatoes. Once we were able to get our server’s attention, she offered to have another plate prepared. That was nice, but it left us in an awkward situation: I could continue to eat while my guest had nothing in front of her, or my meal could sit and get cold while her dish was fired. On the second round my companion was served a thicker piece of grilled fish with warm potatoes and mixed grilled vegetables. The dish was tasty and would have been satisfactory if served at the proper temperature the first time — but if we had been in a hurry, the kitchen would not have had time to re-do the plate to correct multiple errors in the dish. Hotel restaurants in general have poor reputations and Pi Kitchen + Bar is no exception to that rule. It has a lovely atmosphere, but that isn’t enough to compensate for unremarkable and/or poorly executed cuisine. Perhaps hotel venues believe they have a captive audience in the form of guests so there is little impetus to impress diners? The number “Pi” is defined as transcendental, an irrational number and a constant in mathematical equations. Pi Kitchen + Bar wants to be seen as a constant in Midtown, but falls short of the mark. Is Pi Kitchen transcendental? Absolutely not, however I do think that dining there in the future would be considered irrational. Locals are advised to steer clear. Hotel guests? My advice is to bundle up, abandon your hotel, and stroll a few blocks south where you can visit Kinley’s Restaurant for a fine dining experience or Moose’s Tooth for terrific local pizza. Excellent review. Professional and mostly unbiased. Their cream of mushroom soup was the only positive review I’d recommend.